Training DJs is not all he’s doing. Heatherly, an environmental science major with an option in education and water resources, puts his unique skill set to work at Orange Media Network (OMN) every day, acting as liaison between the station and other campus resources, helping departments create podcasts and other news items and, yes, making sure the automation system never stops running. That phrase could just as well sum up OMN’s effect on the Oregon State community and beyond. The student-run network consisting of six student media — four print publications, a radio station and TV channel — has garnered national acclaim. 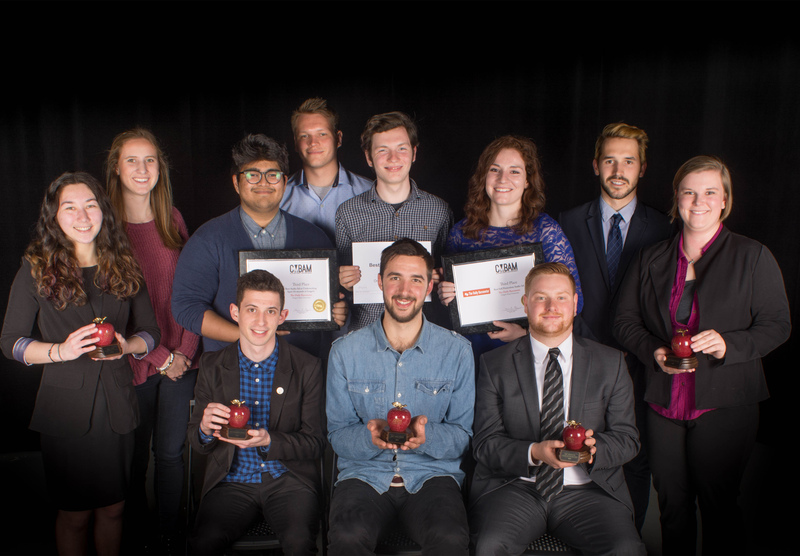 OMN won six awards at the College Media Association 2017 Apple Awards, five of which were first place recognitions in categories such as best news delivery, best newspaper (of four-year universities with a circulation of more than 10,000) and best radio promo. On top of the CMA awards, two of OMN's video students, Lucas Paris and EJ Albaugh, were also recently nominated together for a Northwest Emmy for Best Videographer/Editor. But there’s more to OMN than winning national awards; it also provides students with valuable work experience in a versatile media realm. This goal is important when you consider the wide net OMN has over the Oregon State University campus and Corvallis community. This year, The Daily Barometer — student newspaper since 1896 — changed from a daily print newspaper to daily online newscasts. These segments, called News Blasts, are two and a half minutes and posted every morning. In addition to these daily News Blasts, print publications of The Daily Barometer still come out every Monday on campus and every Tuesday as an insert in The Corvallis Gazette-Times — a total distribution of 12,000 copies each week. The transition to online mini newscasts mirrors major professional publications like The New York Times and NPR. And OMN is taking it a step further, Baltz says. They’ve created a web and mobile department overseen by a student leader of equal status to the editor-in-chief of print publications and the television and FM station managers. This student leader oversees all of the digital strategy for OMN and a staff that works with social media components in creating unique online content. According to Baltz, this position is still in its infancy. “But it’s been really exciting to see it grow. We have three candidates applying for the position this year — three students who see themselves as wanting to move it forward, make it better,” she said. In total, OMN has 15 student leadership candidates ready to take over positions for the next academic school year — an amazing turnout of students excited and willing to move the network forward. In fact, OMN is bristling with just such dedicated student leadership. Claire Wilding, another student worker at OMN, hopes to start a career in the business world one day. Right now, she’s a senior at Oregon State pursuing a Bachelor of Science in Business Management. At OMN, she works as an advertising executive, establishing relationships with different campus departments and organizations to help them advertise events and other promotions through various OMN-operated media platforms. After reflecting for a moment, FM station manager Anthony Heatherly echoes Wilding’s sense of professional growth, and tries to describe the indescribable. “There’s not a job I think I could have had that could have prepared me (so well) to be a manager,” he says about his experience facilitating the behind-the-scenes of KBVR 88.7FM. “Someone calls you and says they’re not coming in, or all of a sudden a meeting gets canceled and you have to reschedule, or you’re waiting on some important information from your advisor but they’re out for the day and you can’t talk to them. It seems like the world, not just Oregon State, is lucky to have these students tasked with delivering its news. They won't, as Heatherly might say, let the tape stop running.